The 2018 Jeep Cherokee is a terrific SUV that has earned a reputation for offering an unmatched level of capability, refinement, and comfort wherever you take it. To allow drivers peace of mind during any drive, Jeep has built their Cherokee with a strong construction and offer customers over 70 standard and available safety systems. This includes the latest active and passive technology which can aid drivers in avoiding a collision and even safely pull into a parking spot. Keep reading to learn more about the standard and available safety features of the 2018 Jeep Cherokee! The Cherokee has been constructed with high-strength steel, which creates a robust body structure. This innovative construction helps to maximize crash protection while optimizing the dynamics of the vehicle and reducing overall weight. Jeep has equipped their Cherokee with an advanced ten airbag system, which includes front passenger knee bolster airbags, driver airbags, and full-length side-curtain airbags. Jeep offers their Cherokee with a unique range of accident avoidance technologies. The Blind Spot Monitoring system has dual radar sensors, which monitors the driver's blind spots and provides both visual and audible warnings to alert the driver. LaneSense Lane Departure Warning with Lane Keep Assist also utilizes radars to monitor for unintentional lane drifts made by a distracted driver. If the audible and visual warnings are not responded to, the LaneSense system takes control to help get the vehicle back into its correct lane. 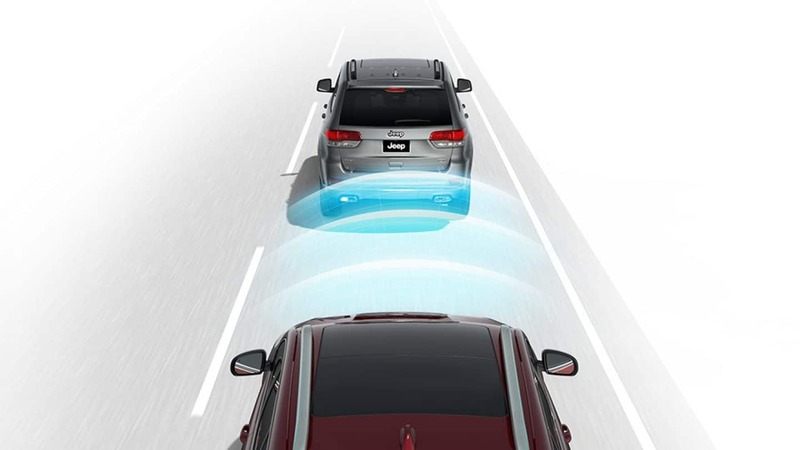 The Forward Collision Warning with Active Braking system features radar sensors that detect if the vehicle is approaching another vehicle too quickly. Drivers are alerted with an audible chime warning, and if they do not react, the Advanced Braking System assists the driver by applying pressure to the brakes. If you live in the city, or often find yourself struggling to find a parking space you can fit into, Jeep has you covered with their convenient parking assistance technology. The standard ParkView Rear Back Up camera displays a video with dynamic gridlines, helping drivers to assess their surroundings and safely reverse. Jeep makes available their ParkSense Front and Rear Park Assist System. With this system, the Cherokee has four sensors integrated on the rear and front fascias. These sensors warn the driver if the Cherokee is too close to an obstacle, whether it be at the front or rear of the vehicle. The Parallel and Perpendicular Park Assist system is able to recognize an available parking space and guide the Cherokee safely into it. With the simple push of a button, the system guides the steering wheel for the correct angle and alerts drivers when they need to shift gears, accelerate, or brake. The Cherokee offers incredible capability wherever you need, whether off the road or in the city. Its versatility and refinement are just two of the reasons why it is a bestseller, but the other is because of its advanced safety and security systems. If you would like to schedule a test drive in a new 2018 Jeep Cherokee to see firsthand how these technologies work, contact us today at East Hills Jeep!